1. First question is: Did not Soken Sensei prefer White Swan? Not Hakutsuru! Well regretfully said, to many have taken for word the Article from May 67 issue Black Belt Magazine. Great Article, and that truly delighted Hohan Soken Sensei. Master Soken told his Yozadake Seito and his personnel American GI group, the Swan was suppose to be Crane. Translator made an error, unkowningly. This has been corrected several times within the Matsumura Shorin-ryu Martial Community for years yet some still don't know. If you check out the translators notes for Hohan Soken's Dojo Kun, it clarifies kanji error. Those that want to continue to teach under the White Swan ideas that is their choice. The White Swan is not within the Okinawan language of karate Termonology. The truth is not just in Name, as long as one teachers properly what they were taught. 2. 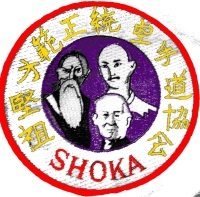 Question of whether Matsumura Sokon's system was the first karate system? Matsumura formalized karate, and may have developed the first official system. Sakagawa may have developed the first karate kata. Matsumura being a young seito under this old warrier, under stoud many things for being so young. This is what happens if young man have proper heart, and learns under Great old Masters. India is the home land to karate as much as China. Yet very little referencing in history. Looking at the old iron statues, observing the knuckles of the ancient Indian Warrier. Woow he knew makawari ne? These being older regions of World that were also roots of Karate. The first Martial Artist I met in my life in 1966 was from Pakistan. For being a short man, he could truly do some unique things. The funniest thing kind of! For being the first Official Martial Art system, it has the smallest following. We will cover that some time in future. This Hohan Soken was becoming aware of so he taught his Yozadake Seito in a timely manner. Lucky that all those that survived, were all well educated men. 3. Sensei Coffman's statement. Rather interesting, I called him two or three times, he might have called me. When talking about giving him a video tape it was not needed initially, since he had copy already from George Alexander. I told him, I would sent a better copy. Yes several times he sent me a e-mail but from his WIFE'S account. What I read was statements by some woman named Mary, demanding my videos. Sorry but no one is going to demand anything. Didn't finish reading them at all! Then after a while decided to read onward and there was Jame's name. I have given freely for years. I am very glad I did not send him my newer super 8s, from 72 and or the Audio tape. This man has given nothing at all, period. Not even a nice thank you for the video, other than a real fast thanks maybe. No questions or comments about video. It seems that this leads me to feel one thing. Anyone that studied truly with Hohan Soken and seeing my video would have questions. Well he had none. Have met others that didn't know Master Soken's dojo at all. Now they narrate a tape, not even knowing what they are talking about, while using my SLIDEs video, without permission. This gentleman yes got certificate signed by Master Soken, and yes the Highest Awarded Rank I have heard of, he has not published his Like I Have Mine, yet. I have told James Caffman three times how honored he should be and that he is Sempei to myself. Yet not one question about working out with Master Soken, or dojo, this makes me wonder. Two times I recalled telling him the story from the audio interview tape from April 1972. Leting Caffman know that Hohan Soken was giving the American OKF to Premru which didn't include Matsumura family at all. Just the Three other Shorin-ryu systems in Okinawa. Not no other karate system, just these three. Sensei James has felt grudged for years for not receiving the OKF. Notifing him of the audio tape he had no interst in even. If I was seito under a Master many years ago and could get a audio tape of this great man, I SURE WOULD. Yet I Pray to God, he is still just to grudged so does't want to talk to anyone. That he truly was taught from basics on up in the Matsumura Shorin-ryu Karate. Would Love to Rei to him if that is true. I Hope So. Have told Mr. James I would enjoy working our with him, and doing seminars together. Instead he just challenged me, so I replied. Yes I will meet you at tournament, and see who wins. Or we could meet at Fise Kise's Summer camp in New Hampshire? 4. Shihan Garrett's Ki concept evolved though evolution; NOT TEACHINGS! Shihan Garrett has added a unique thing into the tai chi world concepts, withou practicing tai chi. Tai Chi utilizes concepts of individual sphere of energy exercises. Shihan Garrett has gone a step further, through a Natural evolution from practice, and not being taught directly. Being taught three speed concepts within Matsumura kata by Hohan Soken Sensei influenced his concepts without a question. Energy Of Ki in Group Circle. First performed publicly Two years ago now, at the World Martial Arts Hall of Fame Seminars. Shihan Garrett for the first time presented his Ki Concepts to the Public. This has been a on going nuturing for Shihan Garrett for years, but now reality. Hanshi Bruce Juchnick from Sacramento California also was inducted into the Hall of Fame. Prior to leaving Sacramento Garrett told Hanshi Juchnick that "he hoped, not to have to follow Bruce's Seminar at the Hall of Fames". Thanks to Ramond Gonthier Hanshi, that did happen. Shihan Garrett had been requested to teach Raymonds leading seito some Matsumura katas. That Gonthier Hanshi was changing his Soken Gokai-do Ryu back to his original form from the true Matsumura katas, he had seen while stationed in Okinawa performed by the late Hohan Soken Sensei; then by Garrett Sensei at the Reunification. There were three katas that started Shihan Garrett's awareness of ki. Passai Sho and Dai katas, but was still bewildered by them. Then Kusanku kata, the first move within form. This was the Matsumura's Tai Chi concepts, if one practiced properly or taught correctly. One would truly have to learn from Hohan Soken Hanshi from roots up to develop these things naturally. It is hard to be a fruit from one tree, yet fall or grow from another. Everthing has it's signature, doesn't matter what. Seito under teacher of karate background. Or a preacher taught by another, would have their qualities it is natural. Those that try to imulate someone they never studied under would have a hard time. Noticing this individual that destroyed my narration and stories reproducing my Slide Vhs tape doesn't know that the Hakutsuru katas he has formal training in! Rather funny, says woow this kata really gives you a good areobic exerice. It really makes you sweat. Funny he didn't learn that he got so tired because the Hakutsuru kata was all open hand, no fist concepts. Then his knees never performed a uke during perfomance either. Performing Hakutusuru kata develops continued ki flow, no body build up. Take any of your long katas, and do it totally open handed using shuto, or nigite. You should notice a unique difference. He learned Hakutsuru from Taiwan master and another gentleman, not sure who. Needs to practice more, and performing it relaxed and slower, will tire him more. Ki flow from beginning of kata through to end. Yes strange how tiring such a soft kata causes. Everyone that I have taught Hakutsuru to all agree, and bewildered. Without learning the soft ki concepts from earlier katas done at prope speed makes a difference. The rotating palms of Gojushiho kata as well, when performed slowly. Do this with all your katas, your awareness of fighting concepts opens. You will see more, but most important soft ki, one learns to read anothers body english, or devevlops a little more ESP. Yes big time. Using the Rotating palms concepts from Gojushiho kata, with the breathing. During inhale cycle rotate palms in backward motion. Exhale cycle rotating forward. Both of these should be done in equal time intervals. Most individuals starting out will use from 5 to 8 seconds inhale @ exhale = 10 -16 seconds. Let the tongue rest upon roof of mouth litely. The initial practice one should breath out loud to help your concetration. Then later gradually breathing ligther and softer increasing the times to 15 - 25 Seconds Inhale/exhale cycle = 30-50 Seconds total one cycle. That takes a while thought take your time, and enjoy. Feel the energy in palms. Now next step is let palms face each other, on inhale separate palms until beach ball size. Exhale reducing down slowly to softball size. Do this repetition for 3 to 5 minutes. You will feel some unique things within palms happening. This is the individual method. If in Group; form circle double arms apart everyone facing into middle of circle. Performing the above exercise's together and then during beach ball concept one person will take lead in group. This again after three to five minutes of beach ball playing. Everyone follow their lead, and slowly open palms out ward: Like Jesus on the Cross, everyone's palms facing into middle of circle. You will feel this energy whether out doors or indoors. You can rotate beach ball but keep palms facing each other, you will see Nihanchi, Kusanku and many other kata concepts happen. The idea of the soft ki from my perspective is Awareness of what is in motion around you. If someone throwing negative energy your direction, you will reflect it. You become aware of the negative individual put out. While in store or at work and home, project to another to look your direction. Push the thought into their head, using the middle eye; area just above and between the eyes. The martial arts and soft ki concepts truly helps one development ESP. So watch out, you may become out spoken and even misunderstood, keep on plugging..